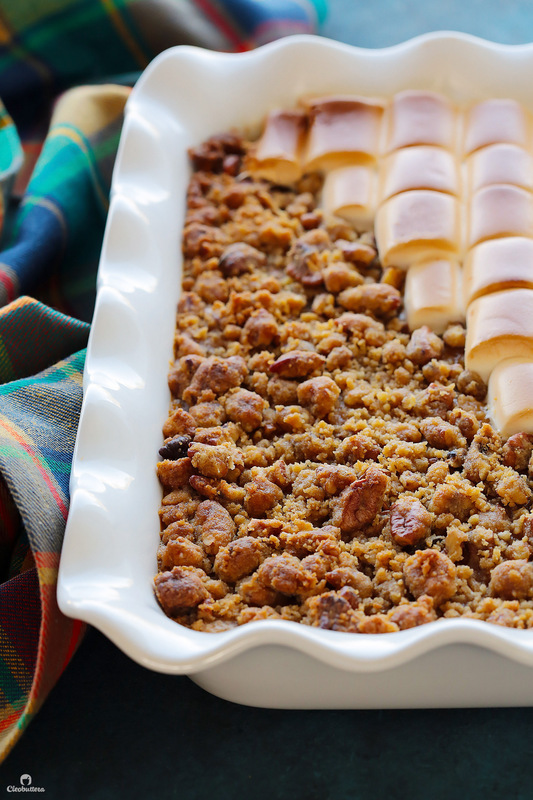 A sweeter version of the loved Thanksgiving side dish, making it perfect for dessert! Creamy sweet potato filling topped with both crunchy pecan topping and roasted marshmallows to satisfy all tastes. The lack of eggs in the dish makes it looser and lighter in texture! Sugary treats like donuts, muffins and pancakes that got away with falling under the “breakfast” category, make me crack. I salute the persuasive powers of whoever made us believe that caramel-laden monkey bread is an acceptable breakfast. Like how did it become ok to eat an 800 calorie cinnamon roll at 7am, but not a slice of chocolate cake?! No complaints here; I’m as guilty as can be. Or maybe I’m just a little bitter that I can’t have chocolate cake in the morning. Whatever makes you sleep at night, but dude…let’s not kid ourselves! We all know they’re just dessert in disguise. Let that sink in for a second. Same thing with dishes like sweet potato casserole that likes to hide under the “side dish” umbrella. The thing has marshmallows on top! What else can it be? 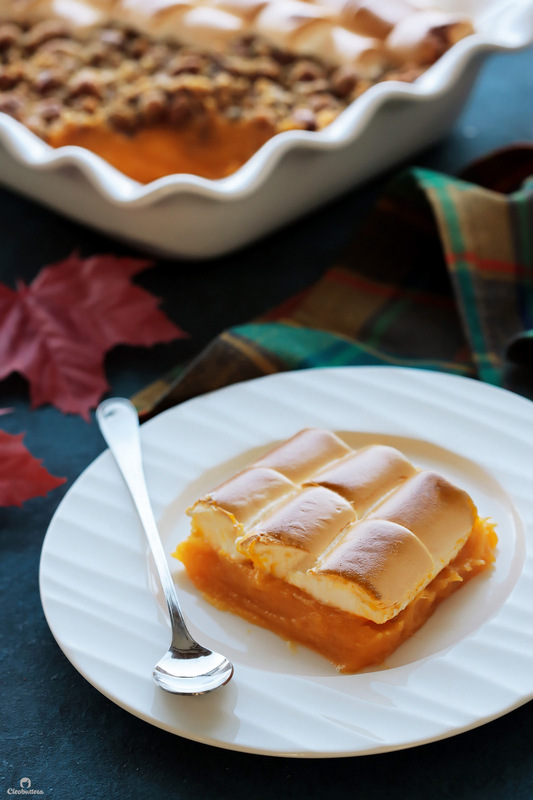 Sweet potato casserole is a North American dish that is traditionally served on Thanksgiving Day. And as much as the rest of the world would like to think that it belongs among all the pies on the dessert table, it is often hanging around next to the turkey and green beans. Now try telling this to my Egyptian family. Even my parents who have lived in Canada for many years, refuse to believe that sweet potato can be anything other than dessert. Sweet potato fries are the exception. And it took a lot of convincing. In all fairness’ sake though, most recipes for traditional sweet potato casserole, keep the sweetness level at bay, making it a well fit in a plate full of savory goodies. This recipe on the other hand, puts the sweetness front and center, making it unmistakingly desserty. 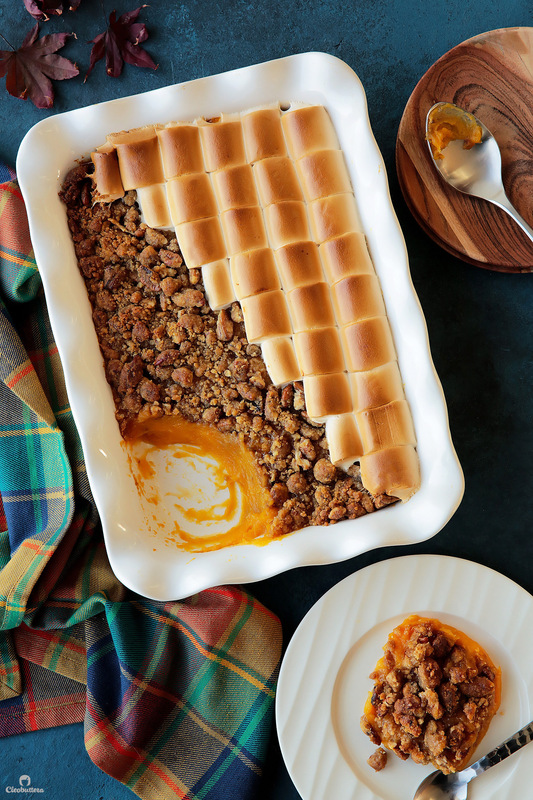 No identity crisis here; this version of sweet potato casserole is dessert and is not embarrassed to admit it. It is sweet enough that it won’t fit on a plate of poultry and gravy, but not overly so that will make your teeth fall off. This one belongs on the dessert table, and unless your guests are expecting the traditional side dish, it is guaranteed to be polished off. I used to think that perhaps our Egyptian taste palate is what’s causing us to prefer the sweeter version of the dish, but after seeing that the winner of my American friend, The Pancake Princess’, Best Sweet Potato Casserole Bake-off, has in fact (what is proportionally) just as much as sugar as this one, I got relieved. 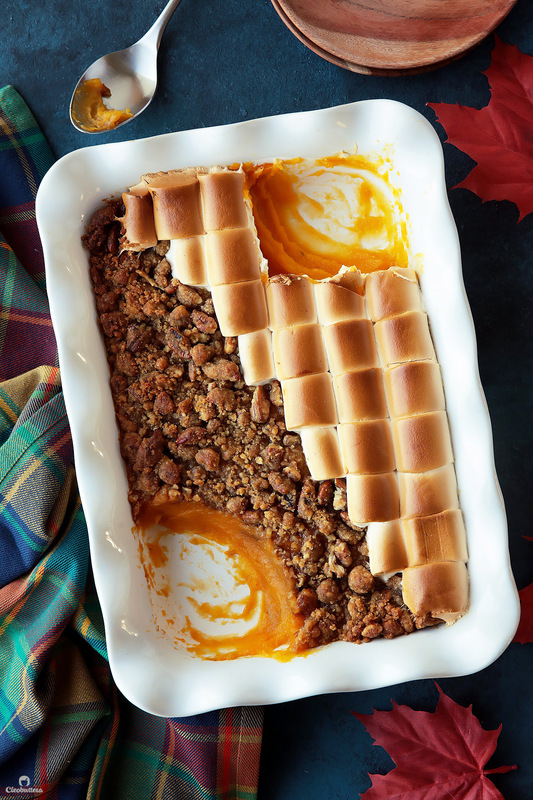 This sweet potato dish will not only win the hearts of those who prefer a dessert-like casserole, but will put an end to the debate of pecan topping vs. marshmallows. Because this baby has both! Crunchy nuts and crumb lovers…this casserole’s got you covered! 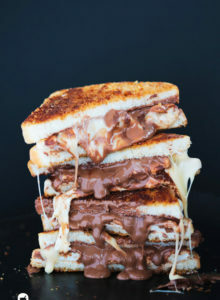 Gooey, toasted marshmallow fans, you have not been forgotten. Just turn the dish around. Indecisive people like myself, who would like a bit of both…we got ya! Another thing that makes this different than traditional recipes, is that it doesn’t include eggs. Because egg is a binding agent, most recipes like to add it in to hold the filling together and give it a sturdier consistency, similar to that of mashed potatoes. Since this one doesn’t have any eggs, it’s looser and lighter in texture, which we actually prefer. There’s really no right or wrong way here; its just a matter of textural preference. The creaminess of this one is also unreal. So ridiculously creamy that it melts in the mouth. 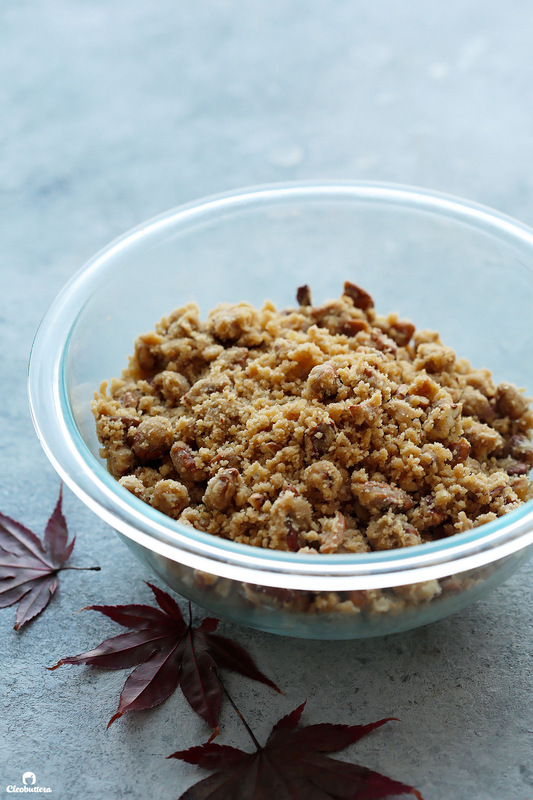 Contrasted with the crunchy bits of pecan topping…it’s just heavenly. 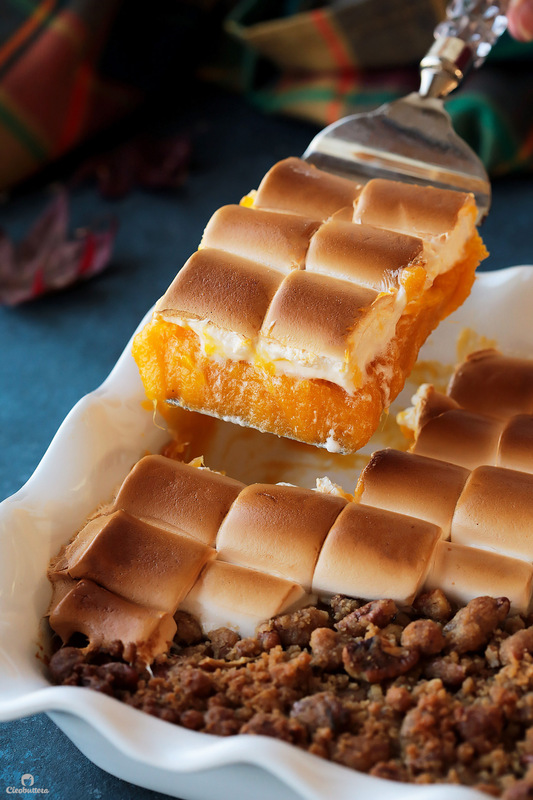 How to make the Sweeter Sweet Potato Casserole? You’ll first need to roast some sweet potatoes. Now don’t be alarmed by the amount…I was making 1 1/2X the recipe for 2 different occasions. So you’re actually gonna need much less sweet potatoes than what you’re seeing here; 2 kilos to be exact. Place them on a baking sheet that’s been lined with foil or a silicon mat. Will make cleaning up later a breeze. Then pierce them a few times with a sharp knife. This creates vents for the steam to escape as they’re roasting. Bake until super soft and cooked through; 45-60 minutes. Then open them up and scoop out the flesh. Mash ’em until very smooth. A potato masher, food processor or ricer all do a pretty great job. While still hot, stir in the sugar, butter and salt. 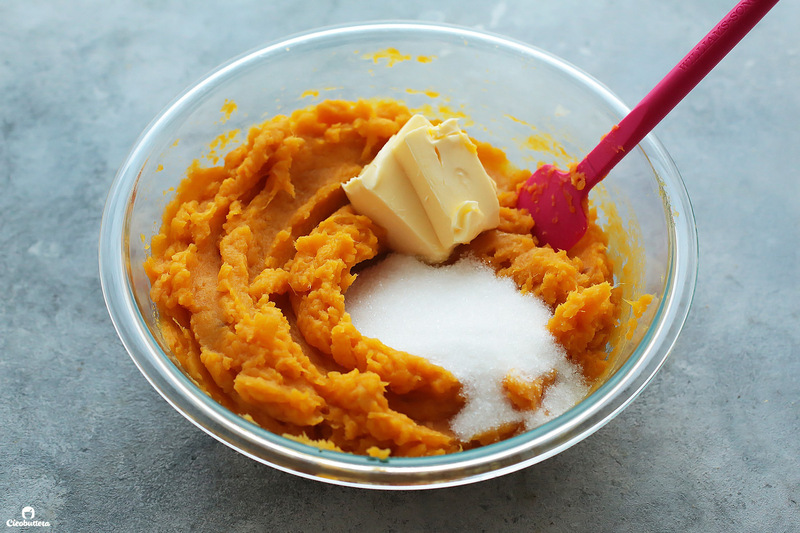 The warmth of the sweet potatoes should be enough to melt the butter and dissolve the sugar. If the sweet potatoes have cooled, use melted butter. For an even creamier texture, stir in some warm milk. 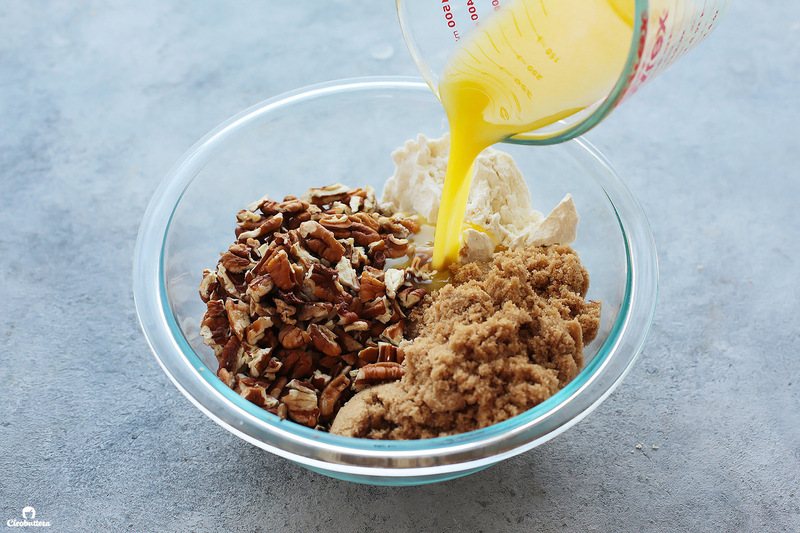 To make the pecan topping, just stir everything together…brown sugar, flour, salt, pecans and melted butter. Then if you want to make all sides happy, sprinkle half the surface with it, and top the other half with marshmallows. Mini marshmallows work great here too; I just couldn’t find any at the supermarket. Now friends! Which side are you on? Are you Team Pecan Topping or Team Marshmallows? Adjust oven rack to middle position and preheat oven to 200C/400F. Line a rimmed baking sheet with foil or a silicon mat. 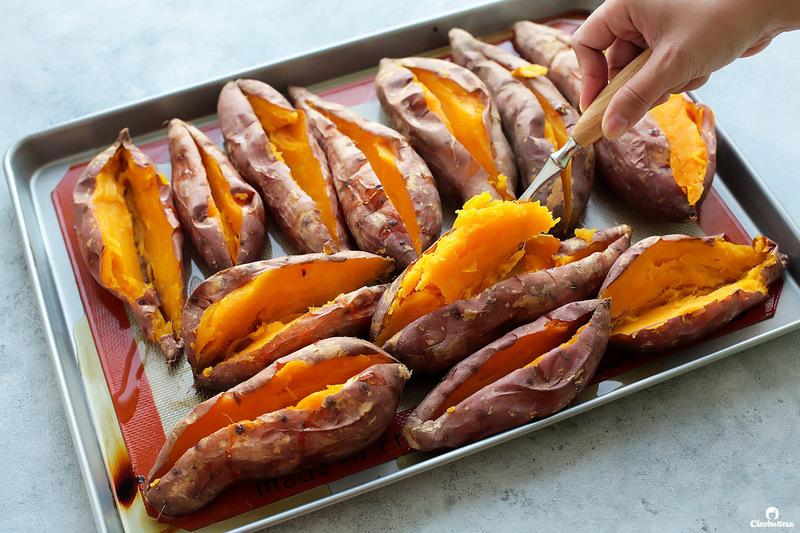 Place the sweet potatoes over the baking sheet and use a sharp knife to pierce them 3 or 4 times to create vents for the steam to escape as they cook. Transfer to the oven to bake until very soft and cooked through, 45 to 60 minutes. 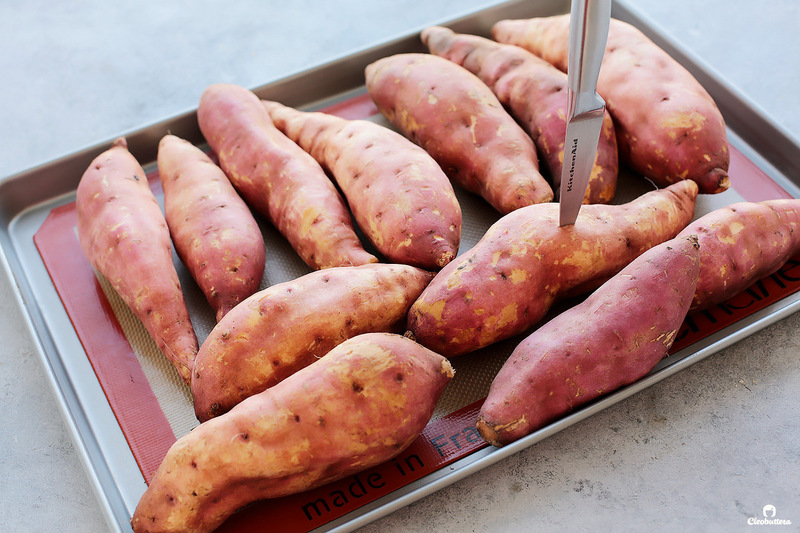 Smaller sweet potatoes will cook in less time that larger ones, so check each one individually for doneness, by inserting a sharp knife in the thickest part of the sweet potato. It should pass through very smoothly and without any resistance. 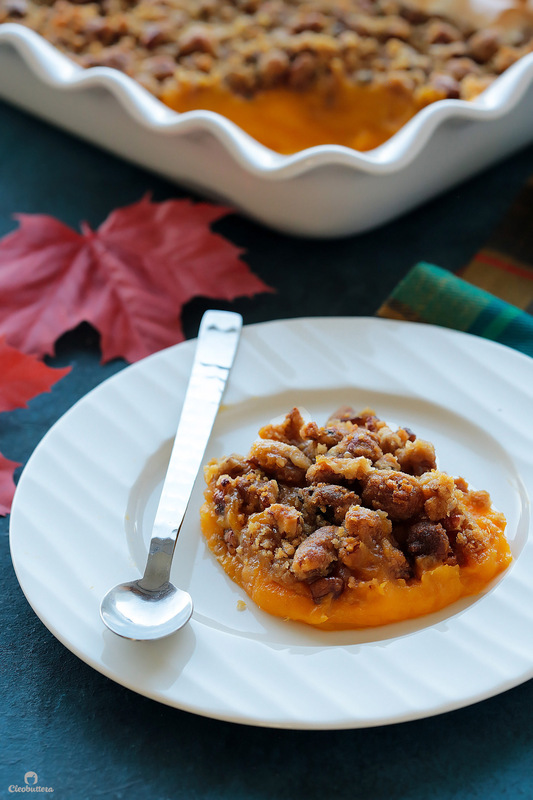 While the sweet potatoes are roasting, make the pecan topping, if using, following the recipe below. Take the sweet potatoes out of the oven and allow them to rest until cool enough to handle; about 5 minutes. Reduce the oven temperature to 350F/180C. Slit the sweet potato in half and using a spoon, scoop out the cooked sweet potato flesh, discarding the skin. You should end up with about 5 cups (1.1 kg/ 2lb 7oz) cooked sweet potato flesh. 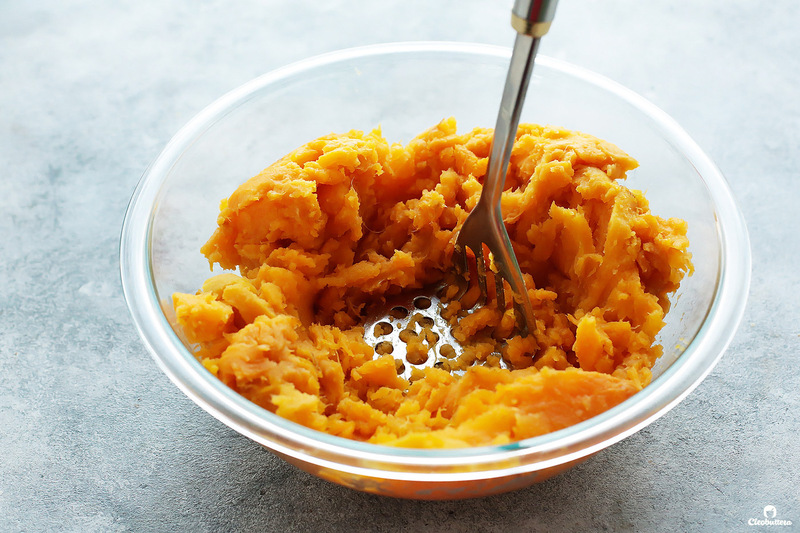 Transfer the sweet potatoes to a medium bowl, and while still hot, mash with a potato masher (or press through a potato ricer) until very smooth and no lumps remain. While still hot, add in the butter, sugar (start with 1 cup (200g)) and salt and stir with a spatula until well incorporated and the butter has fully melted into the mixture. 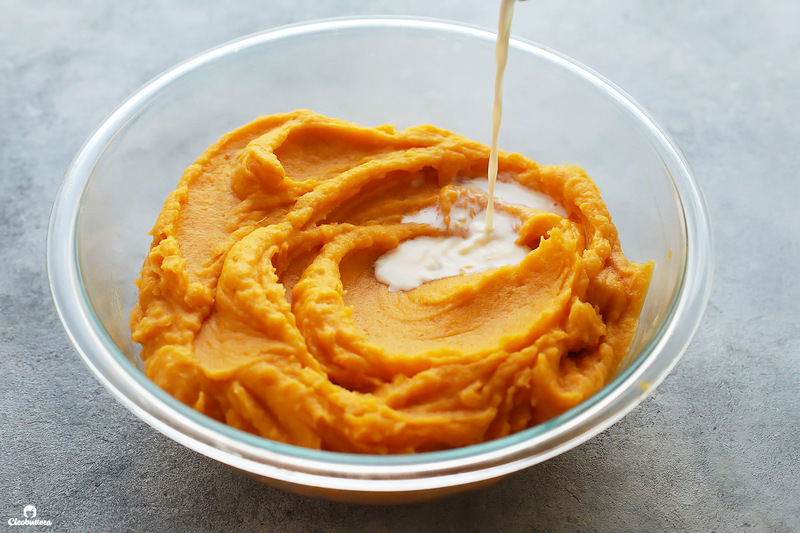 The warmth of the sweet potatoes should be hot enough to melt the butter and dissolve the sugar. 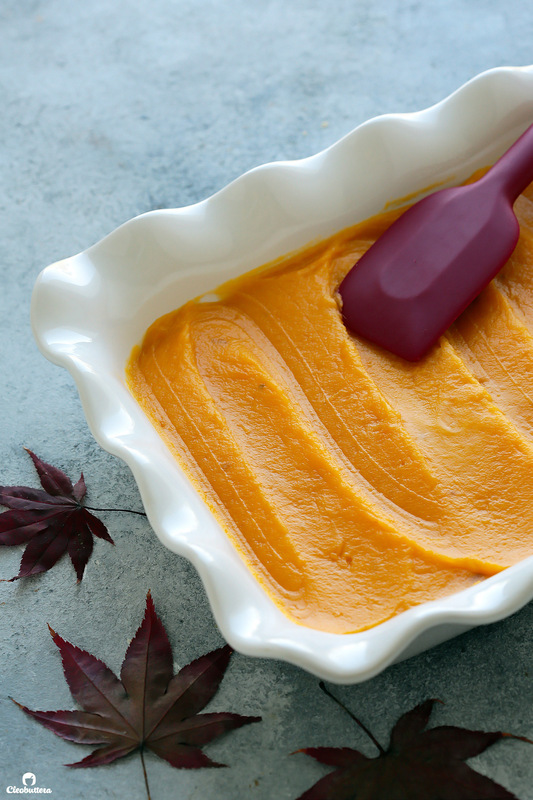 If the sweet potatoes got cold on you, use melted butter instead. Stir in the milk until well mixed and very smooth. Taste the mixture and add up to 1/3 cup (68g) more sugar, if desired. I use the full 1 1/3 cups (168g), but we like it sweet! Transfer the sweet potato mixture to a 13X9 baking dish and smooth out to level. 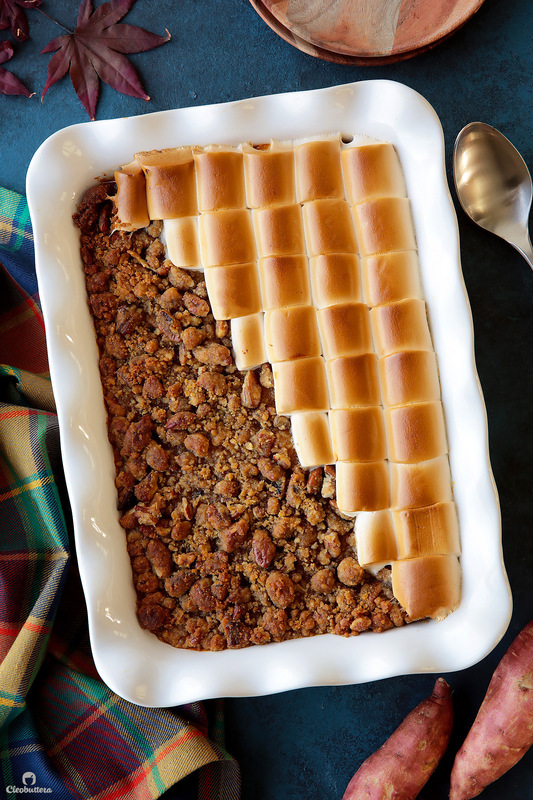 Top with either the pecan topping (recipe below) or marshmallows. 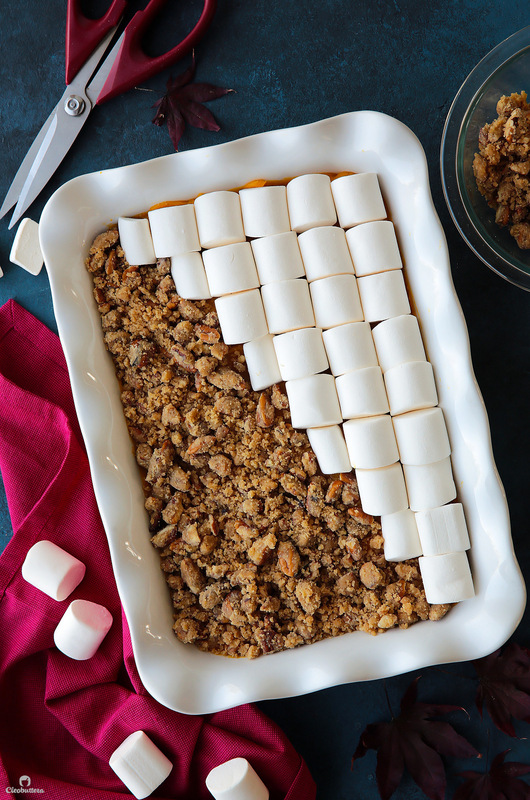 If making a half & half casserole like the pictures, sprinkle diagonally 1/2 recipe of the pecan topping over half of the dish, then arrange 1/2 amount of marshmallows over the other diagonal half. Please read all the way through the end of this step before proceeding. Keeping a close eye on the marshmallows, bake for 25 to 30 minutes, or until the pecan topping has nicely browned and the marshmallows are deep golden brown in color. 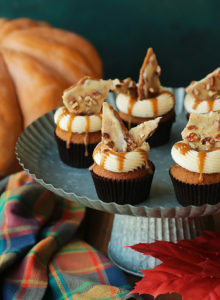 Depending on the brand and size of the marshmallows, there's a possibility that they may brown before the pecan topping does. So check after the first 8 minutes of baking on the marshmallows. Continue checking every few minutes until the marshmallows have reached your desired level of color. If by that time, the pecan topping had not browned, very loosely tent the marshmallow side with foil, being careful not to let it touch the marshmallows. Continue baking until the pecan topping is set and nicely browned. Remove foil from marshmallow side before serving. Alternatively, you can bake the casserole for the first 15 minutes without the marshmallows (with the pecan topping covering only one side). Then take the dish out of the oven, arrange the marshmallows on the other half of the dish, then continue to bake until the marshmallows have browned. Serve warm. In a small bowl, stir together the butter, brown sugar, flour, salt and pecans, until evenly moistened and crumbs form. 2 kilos (4lb 7oz) raw sweet potatoes should yield about 5 cups (1.1 kg/ 2lb 7oz) cooked and mashed sweet potato flesh without the skin. 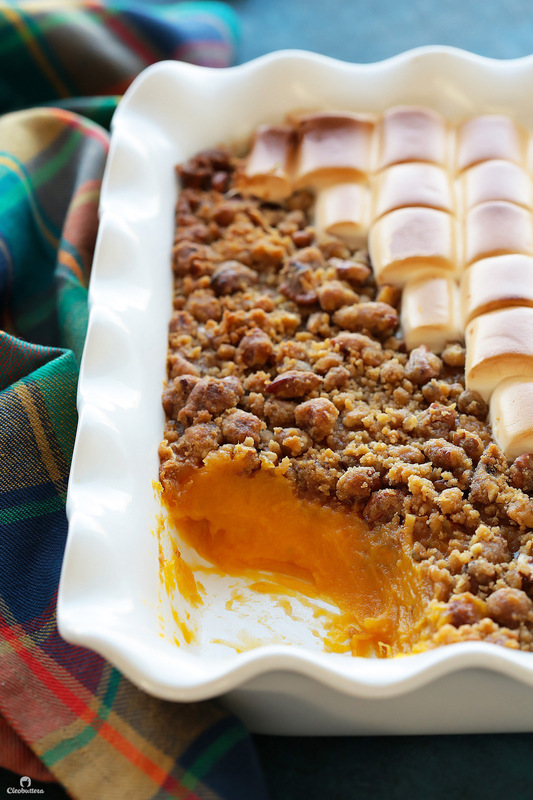 We prefer a sweeter sweet potato casserole that is served as dessert instead of a side dish. For that reason, the sugar amount here is slightly higher than most traditional sweet potato casseroles that are meant as a side. Feel free to reduce the sugar amount to 1 cup (200g), for a less sweet dish. Because natural sugar levels in sweet potatoes vary greatly depending on variety and season, it might be a good idea to adjust the sugar amount according to taste. Start with 1 cup (200g) sugar; if desired, add up to 1/3 cup (68g) more. The marshmallows I used here are Haribo brand which are slightly smaller than American brands such as Jet-Puffed and Campfire. Due to their smaller size, I kept the marshmallows whole, but you could most certainly use half as much, sliced in half, if you prefer. If using larger brands, you'll need half the amount of marshmallows, cut in half either horizontally or vertically. Arrange them cut side down over the casserole. If using mini marshmallows, use just enough to cover the surface of the casserole. Make ahead tip! 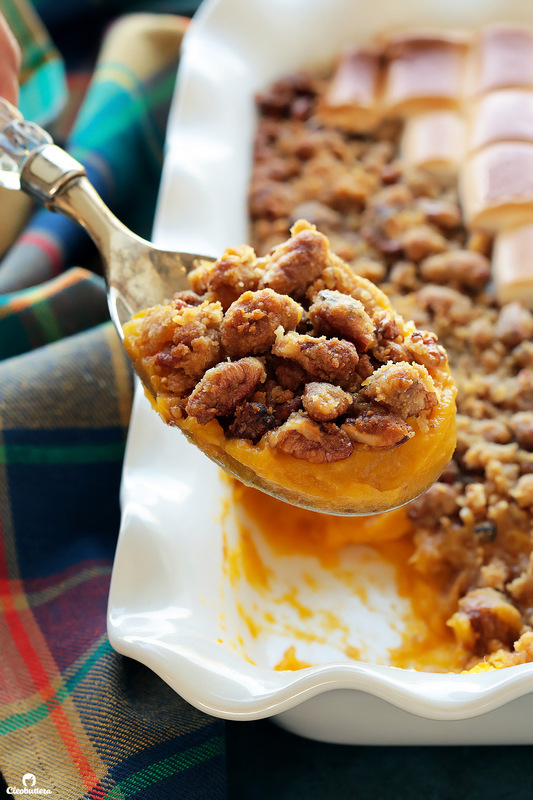 Prepare the sweet potato filling and top with the pecan topping only. Cover tightly with plastic wrap and refrigerate up to 2 days in advance. Allow it to come to room temperature before baking, then top with the marshmallows and bake as directed. Recipe inspired by my sister-in-law, Sara. Hello Nihal! Please allow me to apologize for my embarrassingly late reply. I had technical issues with the comments section for the past couple of weeks that disabled me from replying, nor receiving new comments. So happy it’s fixed now, along with a new look for the blog! You can surely substitute any topping you like here, or omit them all together. One suggestion would be to sprinkle the surface with sugar, which will caramelize and harden as the casserole bakes, and become just like creme brûlée. Hope that helps!